Don’t shop ’til you drop on Black Friday. Grab a bite to eat and power through those deep discounts with some free (or almost free) grub. Unless you’ve packed a to-go picnic of leftover Thanksgiving meals, chances are you’ll be needing some sustenance while navigating the crowds. Luckily, many of the country’s largest fast food chains will have freebies and discounts all day during one of the busiest shopping days of the year. Some of these food deals are so good, you might be tempted just to go out to eat. The home of the Whopper is offering a freebie deal on its signature burger — but you’ve got to do a little legwork first. First, burger lovers need to sign up at Burger King’s new Whopper Shopper site. Then, to score a burger credit, simply click on one of the connected stores to make a purchase and “Whopper Shopper pays back a portion of your purchase price in Whopper credit.” The deal is good through Cyber Monday but, due to high demand, the chain says the deal is limited to three Whopper vouchers per customer. Nov. 23, the day after Thanksgiving, also just happens to be National Espresso Day. It feels just as exciting as Black Friday because Dunkin’ Donuts (soon to be just Dunkin’) is going to give us all the caffeine we need to get through our shopping lists by offering 50 cent shots of its new espresso in any drink. The chain will also be serving medium lattes and cappuccinos for $2 all day at participating locations through Sunday to keep shoppers and holiday travelers happy. This popular restaurant known for its hearty meals is offering a little treat (well, two, actually) from Nov. 23 through Nov. 26. When you buy a gift card for $25 or more, you can enjoy two free slices of cheesecake on the house. The gift card is redeemable Jan. 1 through March 31, 2019, so if you won’t be able to use it right away. This bicoastal ice cream shop will dish out buy-one-get-one half-off ice cream sandwiches for Black Friday so you and a friend (or just you … we won’t tell) can satisfy any serious sweet tooth. Buying books on Black Friday? Start the day at a Barnes & Noble bookstore to snag a buy-one-get-one-Starbucks drink until 10 a.m. at participating locations. You can also score a buy-one-get-one half-off box of Godiva chocolates. This chain not only released a Turkducken (that’s a chicken stuffed into a duck, all stuffed inside a turkey) sandwich in honor of turkey day, but it will also give you one cookie for free on Black Friday. If you buy a gift card worth $25 or more on Cyber Monday, Nov. 26, you can get a free sandwich, too! This convenience store chain really got creative with its Black Friday “Bring Your Own Cup” promotion this year. 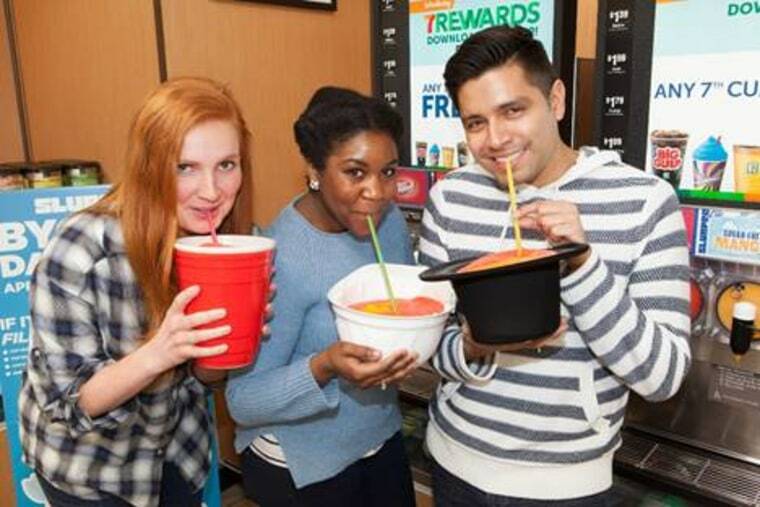 At all of its locations around the world, 7-Eleven is inviting customers to fuel up on Slurpees from 11 a.m. to 7 p.m. For just $1.50, folks can fill up a cup of any size — and really any type of cup goes. Leak-proof hats, mixing bowls or oversized Solo cups are all viable options. However, the chain said in a press release that sleighs are not welcome. We changed our mind, don’t go shopping at all. Just stay home and order in. Food delivery service DoorDash has partnered up with a bunch of restaurants like Wendy’s, Applebee’s, Wingstop and Chick-Fil-A to give a side of free french fries to the first 15,000 customers who place a food order in the app. Just use the code “BlackFryDay” (clever!) when you order online or in the app. With Chick-fil-A’s most popular item being fries, there will probably be a lot of waffle fries flying through front doors on Friday.